Pico-Union is a neighborhood in Central Los Angeles, California. The name "Pico-Union" refers to the neighborhood that surrounds the intersection of Pico Boulevard and Union Avenue. Located immediately west of Downtown Los Angeles, it is home to over 40,000 residents. The neighborhood contains two historic districts, both listed in the National Register of Historic Places. It has five public schools as well as a public library. Google Maps draws the following boundaries for Pico-Union: Olympic Boulevard on the north, the Harbor Freeway on the east, the Santa Monica Freeway on the south and Hoover St. on the west. 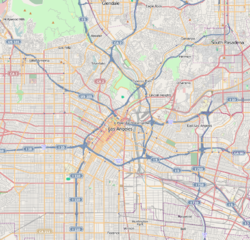 According to the Los Angeles Times' Mapping L.A. project, Pico-Union is bounded by Olympic Boulevard on the north, the Harbor Freeway on the east, the Santa Monica Freeway on the south and Normandie Avenue on the west. It also includes the California Highway Patrol station beneath the freeway interchange northeast of Washington Boulevard. Pico-Union is flanked by Koreatown and Westlake to the north and northeast, Downtown to the east, Adams-Normandie, University Park and Exposition Park to the south and Harvard Heights to the west. The Doria Apartments, a Los Angeles Historic-Cultural Monument. The area encompassed by Pico-Union was developed as a middle and upper middle class residential district beginning in the 1910s. Easy access to downtown Los Angeles and the nearby Wilshire District drew large numbers of affluent homeowners. Following the Second World War, the Pico-Union area, like many inner city neighborhoods, experienced an outflux of residents to the suburbs. The loss of residents and business led to high vacancy rates and lower property values in much of the neighborhood by the 1960s. In the late 1970s and 1980s, the area became a major point of entry for Salvadoran and Guatemalan immigrants seeking refuge from civil war, according to the Pico Union Self-Guided Walking Tour, published in 2009 by the Los Angeles Conservancy. Pico-Union became the city's 19th Historic Preservation Overlay Zone on August 10, 2004. It contains two historic districts listed in the National Register of Historic Places: South Bonnie Brae Tract Historic District and Alvarado Terrace Historic District. In August 2012, the City of Los Angeles designated a portion of Vermont Avenue in Pico-Union as El Salvador Community Corridor; parts of Pico-Union are also being considered for designation as The Central American Historical District. The former First Church of Christ, Scientist, once one of Jim Jones' Peoples Temples, was located in Pico-Union, at the corner of Alvarado Street and Alvarado Terrace. Pico-Union is the fourth-most-crowded neighborhood in Los Angeles, surpassed only by East Hollywood, Westlake and Koreatown. The 2000 U.S. census counted 42,324 residents in the 1.67-square-miles neighborhood—an average of 25,352 people per square mile. In 2008, the city estimated that the population had increased to 44,664. The median age for residents was 27, considered young for the city and the county. The ethnic breakdown in 2000 was: Latinos, 85.4%; Asians, 7.6%; whites, 3.0%, blacks, 2.9%; and others, 1.1%. El Salvador (44.4%) and Mexico (23.3%) were the most common places of birth for the 64.6% of the residents who were born abroad, a figure that was considered high in comparison with foreign-born in the city as a whole. Other immigrants come from Guatemala, Honduras and Nicaragua. The median household income in 2008 dollars was $26,424, considered low for both the city and the county. The percentage of households earning $20,000 or less was high, compared to the county at large. The average household size of 3.3 people was relatively high for Los Angeles. Renters occupied 90.5% of the housing units, and home- or apartment owners the rest. The percentages of never-married men (43.4%) and never-married women (36.2%) were among the county's highest. The census found 2,113 families headed by single parents, the 23.3% rate being considered high for both the city and the county. In 2000 there were 667 military veterans living in Pico-Union, or 2.3% of the population, considered a low rate for the city and the county overall. Pico-Union residents aged 25 and older holding a four-year degree amounted to 6.7% of the population in 2000, considered low for both the city and the county, and there was a high percentage of residents with less than a high school diploma. 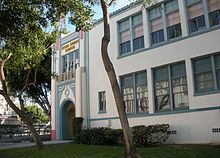 SIATech Pico-Union is a public charter high school, 2140 West Olympic Boulevard suite 327. "Classes are held from approximately 9:00 am - 4:00 pm. This site is an independent study school where students complete work at home, online and on site." Los Angeles Public Library operates the Pico-Union Branch Library at 1030 South Alvarado Street. Angelus-Rosedale Cemetery was founded as Rosedale Cemetery in 1884, when Los Angeles was a small city of around 28,000 people, on 65 acres (260,000 m2) of land between Washington and Venice boulevards (then 16th Street) between Normandie Avenue and Walton and Catalina Streets. ^ Pico-Union, Layers of History (PDF). Los Angeles Conservancy. 2009. ^ Google (20 November 2018). "The Pico-Union Neighborhood as indicated on Google Maps" (Map). Google Maps. Google. Retrieved 20 November 2018. ^ "Population Density". Los Angeles Times. Mapping L.A. Retrieved June 12, 2016. ^ "Los Angeles County History - An Illustrated History of Southern California - Los Angeles City". CalArchives4u.com. The Lewis Publishing Company, Chicago. 1890. Archived from the original on 2008-03-11. Retrieved 2008-04-11. 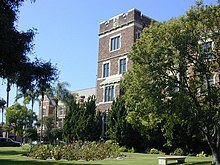 Wikimedia Commons has media related to Pico-Union. This page was last edited on 20 November 2018, at 18:28 (UTC).